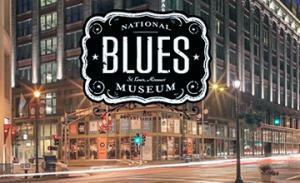 St. Louis, MO – The National Blues Museum is pleased to announce the lineup of festivities in honor of its Grand Opening Day, taking place on Saturday, April 2. Sixth and seventh streets between Washington Avenue will be blocked off between 9:00 a.m. and 10:10 a.m. in order to allow for visitors and museum supporters to have space to enjoy the outdoor festivities. The day will begin with a musical procession from the Normandy High Schoolmarching band at 9:30 a.m. The band will start marching at the corner of Sixth and Washington Avenue and lead a procession to the front door of the museum. The procession will be followed by remarks from Chairman of the Board Rob Endicott, Executive Director Dion Brown, and Mayor Francis Slay. After the ribbon cutting, the museum will officially open its doors to the public at 10:00 a.m.
Once the doors open, there will be an all-day rotation of live entertainment inside the Lumière Place Legends Room until 4:00 p.m. Blues rock band Phi will kick off the day, followed by performances from blues musicians David Dee, Jeremiah Johnson, Marquise Knox, Jim McClaren, Mickey Rogers, and Renee Smith. Rogers, a singer-guitarist, and McClaren, a harmonicist, are both featured within the museum. The concerts will be emceed by Big Llou, host of Sirius XM’s Bluesville channel. Visitors can also tour artist H.C. Porter’s “Blues @ Home: Mississippi’s Living Blues Legends”exhibition, which will be on view in the Scott and Diane McCuaig and Family Gallery. Porter created 31 paintings of Mississippi-based blues artists and has paired them with oral histories from each subject. The exhibition includes images of world-famous performers, including the late David “Honeyboy” Edwards, the late B.B. King, and Bobby Rush. The National Blues Museum is the only institution of its kind dedicated exclusively to preserving and honoring the history and legacy of Blues music and its impact on American and world culture. Opening to the public in April 2016 in downtown St. Louis, the museum’s mission is to be the premier entertainment and educational resource focused on the blues as the foundation of American music. Voted as a top travel destination in 2016 by The New York Times, Smithsonian.com, and CNN, the National Blues Museum uses artifact-driven exhibits, live performances and interactive galleries to perpetuate blues culture for future generations of artists, fans and historians. Conveniently located at the center of St. Louis’s convention and tourism district, the museum is within walking distance of the iconic Gateway Arch, the home venues of the MLB’s St. Louis Cardinals and the NHL’s St. Louis Blues, and many other attractions and amenities. For more information, visitwww.nationalbluesmuseum.org.